The classic PB & J sandwich remade into a fun summertime desert? 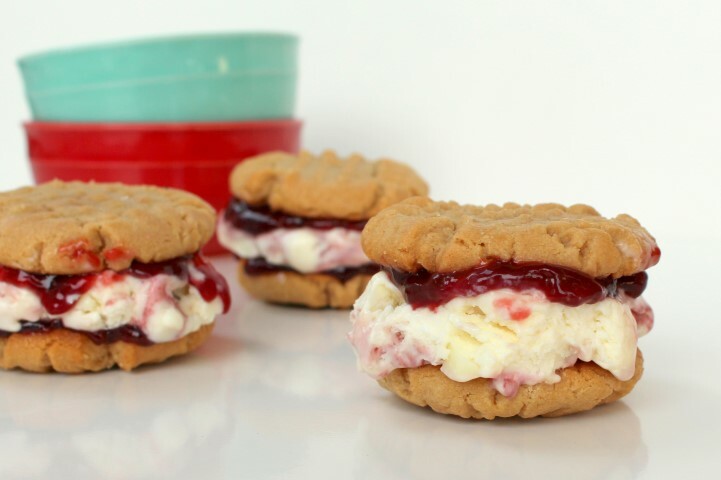 These Peanut Butter and Jelly Ice Cream Sandwiches feature soft peanut butter cookies, vanilla or raspberry ice cream, and a layer of fruity goodness. This recipe was inspired after a week of too many peanut butter and jelly sandwiches at work. Some days I am motivated and have wonderful, healthy lunches and other days I end up with a peanut butter sandwich; the result of not getting up early enough. At work I was dreaming up how I could improve the classic sandwich for a better lunch and of course my sugar-lovin’ mind turned it into desert. Now this doesn’t solve my lunch problem, but it did create a fun easy treat for Tyler and I one very hot evening. I should know by now not to try and take ice cream picture on sultry 90 degree days. As I’ve mentioned before, I take almost all of my pictures outside and ice cream just doesn’t sit there nice and pretty on a hot day waiting for it’s picture to be taken like a cookie does. A smarter food blogger would have planned this recipe out months ago and photographed it in cooler days gone by. But who dreams about ice cream in the winter? If I was considering a peanut butter and jelly reincarnation in the winter, I would have probably dreamed up peanut butter and jelly hot chocolate. Yep, be glad the inspiration struck me when it did. Remove from the freezer and place a scoop of ice cream on top of the jam. Top with another cookie and enjoy immediately. Oh my goodness, this is so creative too! I know the kids would love these! Pinning and I’m going to stumble these too! We’d love to have you join us at Foodie Fridays if you have a free moment! Peanut butter and jelly is always a hit. Looks like a favorite for sure! what a fabulous idea! My kids would love these! 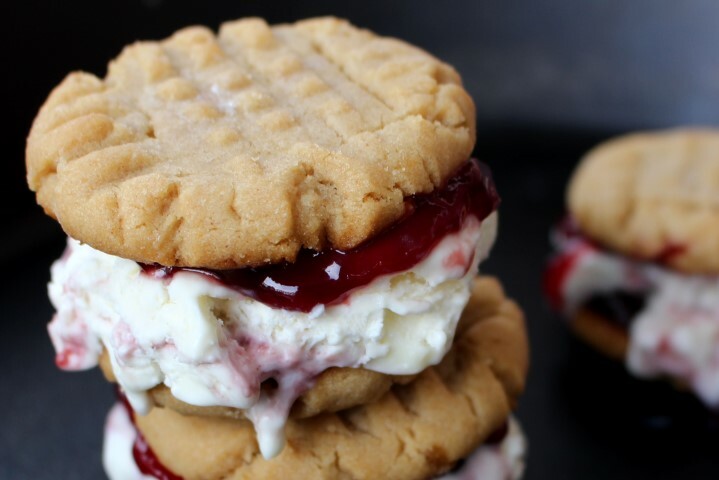 I’ve never thought to use pb cookies for an ice cream sandwich! heaven! 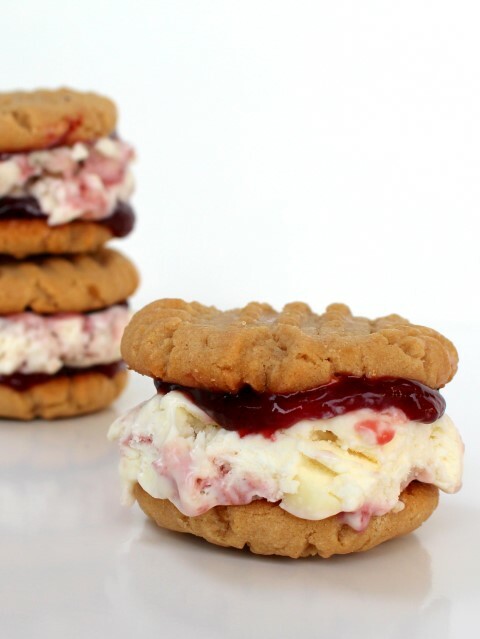 What a fun idea for ice cream sandwiches! These sound amazing! Oh my goodness. Are you kidding me with these!? Are they real?! They look so beyond amazing and whimsical and fun. Perfect for a fun summer party. I will absolutely have to make them when family visits later this summer. Pinning, for sure! What a fun twist to regular PB & J! Love it! Thanks for linking up at What’s Cookin’ Wednesday! Yum! What fun sweet treats. Thanks again for sharing on the Monday Funday Party!